There was plenty of talk about the introduction of a regional fuel tax yesterday following an announcement by new Transport Minister Phil Twyford that one would be introduced in a matter of months. I thought I’d pull together a couple of my thoughts about aspects related to a potential regional fuel tax. The first two were within 1km of each other and all but the second one were the same company. Followers on twitter highlighted locations in Auckland with prices ranging from $1.66 to $2.04 per litre, a range of 38c. Given these stations all had customers filling up, it’s clear that price isn’t the only thing that determines where people get their fuel. I’d think many people might not even notice a 10c per litre fuel tax. A 10c per litre increase in fuel tax, at least for Auckland, is no small increase but just how much impact it has could be tied to how long it takes to introduce, i.e. it may be introduced over a few years which would also lessen the direct impact of doing so. The table below shows total amount of petrol tax over time (not adjusted for inflation). The colours show who was in government at the time and you can see that both of the last two governments have increased fuel taxes fairly regularly. Just how much would 10c per litre regional fuel tax raise? One of the beauties of fuel taxes is they have really low overheads to administer. I believe that essentially, fuel companies just report how much fuel they’ve sold and pay the government the relevant amount of tax they’ve collected on their behalf. In previous times this debate has arisen, I’ve heard sometimes heard commentary that we don’t know how much fuel is sold in Auckland to properly allocate the funding collected back to the region. The good news is that’s not correct and the amount of fuel sold is even reported regularly by Auckland Transport. This is shown below. As you can see, in the 12-months to July, it appears that about 1.1 billion litres of petrol was sold and close to 650 million litres of diesel. At 10c per litre, that equates to about $110 million of fuel tax. Diesel is a bit harder given it’s used for non-transport purposes. For this analysis I’m going to assume about half of the diesel sold would be eligible to pay the tax. However, it may be administered some other way. Some quick calculations suggest it could add possibly another $30 million to the total, bringing it up to just over $140 million annually. That might not be enough to fund big projects like the CRL or Light Rail but it could certainly help towards that goal. 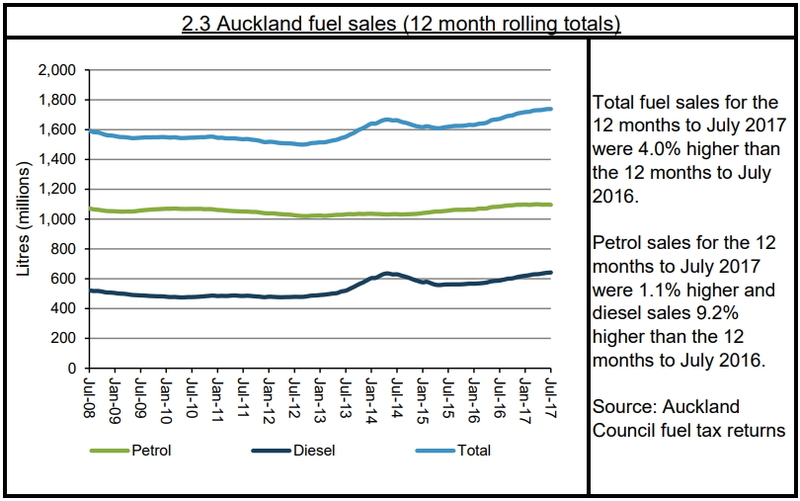 It’s also interesting to note that petrol sales in Auckland have been relatively flat since July-08 while diesel sales have been increasing. That is a similar trend we’ve seen in other metrics. 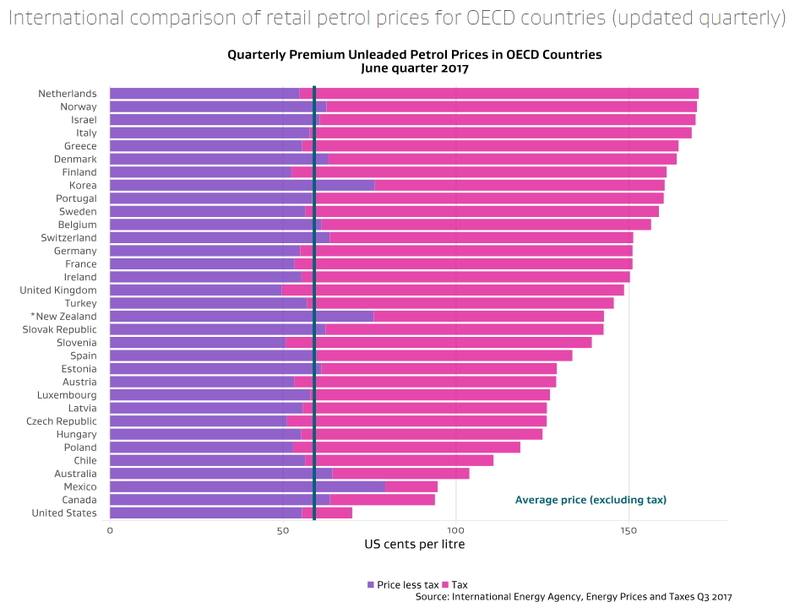 The Ministry of Business, Innovation & Employment (MBIE) publish this graph showing the price of petrol and the component of taxes from OECD countries. You can see that New Zealand is in the middle of the pack for overall price but that’s primarily because of higher base costs. If we were to look only at fuel tax we’d be near the bottom of the list. Mayor Phil Goff has been loudest about wanting regional fuel taxes and so all the talk has focused on Auckland. However, once they’re allowed you can be sure that other regions will want their own versions. For example, I can see Wellington wanting it, perhaps to implement light rail, maybe Christchurch too. I bet there are probably a myriad of local projects that councils may want to push ahead with the help of extra fuel taxes. Speaking of Goff, as you can imagine he’s happy with the outcome. National pushed another Waitamata crossing out till after 2040 as no longer any need, as the bussway mass transit has proven above expectations. Remind me, who is paying the debt down for the North Shore busway, the only Rapid Transit busway in the city? Is it ‘All Aucklanders’? Nzta and by extension all tax payers paid for the ‘busway’ , the North shore city council read shore ratepayers be paid for the stations. I think the communication of the purpose of this tax is important, it is to ensure the pot is big enough to pay for all of the projects needed in the next ten years, not to pay for specific projects as the Herald have been claiming. I’m not sure that building Penlink or removing the toll on the between Orewa and Puhoi would really benefit that many people on the North Shore. We all benefit from different infrastructure paid for at different times. People who live on the shore benefit from a bridge paid for by users between 1959 and 1983, and also a central government funded busway built last decade. People who live near the existing rail lines benefit from decisions made in the 1800s, 1930s and post 2000. I live in Panmure and already have good rapid transit, but am happy to pay to ensure others do as well. The regional fuel tax money goes into the transport pot along with a lot of other tax and rate money, and a huge amount of projects of all kinds come out. It’s a bit arbitrary to say the fuel tax is to pay for light rail. It’s perfectly valid to say the fuel tax is paying for the CRL or Mill Road or Penlink instead, and that the other monies are paying for light rail. The beauty of a light rail line like that is that it provides just the same high level off access to any point along it. While it will be great for getting to the CBD, It’s not just about the CBD: the line will be just as fast and have just as many trains going to Westgate (for example) as anywhere else. Those two light rail lines they are talking about will have something like 24 (i think) new stations between them. That’s 24 neighborhoods and town centres that are linked together, which actually works out to over 500 possible new linkages from suburb to suburb by train. Of course that is just the light rail alone, but you can also catch it to a station to connect to the other four train lines or the busway. Add all that together and we have about 70 rapid transit stations of various kinds linked together… which means almost 5,000 station to station possibilities across Auckland! That folks is how a network works! One issue I have with the proposed route will be the linkage between the New North Road LR Station and the Mt Eden Station. It’s going to be really awkward getting a quick connection between them and I can imagine it would be quite a popular transfer for people coming from the west and heading south to the airport or vice versa. Agree, the transfer between the Western HR line and the Airport LR is disappointing given one literally passes over the top of the other one. Maybe the LR should go down Sandringham. This aligns it with the Kinglands station. Plus the strip and down to Stoddard Rd is all Terrace Zone. Unlike Dominion which is a mix. The end of Sangringham Rd/SH20 may be easier to buy up and built a station junction with commercial land vs the residential low rise land at Dominion/SH20. I dont have children but should I pay taxes to fund education? Of course I should. It is dangerous to look at taxes only in terms of our narrow self interest. In the end we pay taxes to ensure our society has the things it needs to be stable and livable. That being said I agree other PT improvements should be funded with a levy. I also encourage governments to look at other motoring revenue, including to levy city parking stations. These are extremely profitable and directly cause the problem. In some Aussie cities there is a charge of $1000/space annualy (or more) to be able to hire out parking spaces (i.e. Not for residential use). In Auckland that could generate $50 million/year. A French PT funding mechanism is the versement tax (payroll tax). US cities impose small sales tax levies. Lots of ways to do it. I think the real challenge is to get a consensus of what projects will be funded from any new funds. There are numerous plans for transport but none that the public appear to be completely behind. Some good simple explanation of the benefits of light rail to the airport might be useful, avoiding any rhetoric from politicians. AT have release plenty of simple information explaining the benefits over the years. Also recent polls suggest the majority of Auckland ‘Public’ are behind light rail to the airport so pretty sure that information has be distributed rather effectively. Penlink has been on the cards for such a long time, but don’t expect it to make much movement anytime soon. It has a mediocre business case with the greater of 10,000 people (much of the east of the Whangaparaoa Peninsula) being in direct benefit – compared to over 150,000 for each light rail corridor. Penlink is expected to be tolled if construction ever goes ahead. Basically agree. There needs to be better communication of what this money is for. There needs to be spending all over the city, esp in the areas that lack good options, particularly the East and South West. Your argument seems to be that we should never build anything unless either everyone uses it or it is user pays. By that argument I very rarely use any motorway so I want a refund. Too right. I am so sick and tired of people moaning that unless they use it, they shouldn’t pay for it. I never venture to the North Shore and I have never once used the busway but I am sure my rates are paying the debt for that busway. I never venture out west and have only used the tunnel once but I am pretty sure my taxes are paying to make life easier for those out west to use that tunnel to get south. It is an absolutely ridiculous argument. On this basis, nothing would ever get built because smaller communities would only be responsible for paying things in their immediate area. GST on the 10c and further price increases as a result of the plunging exchange rate which Winston wants at .60c USD. I’m sure poor South Auckland factory workers will rejoice at this news. I think that it’s safe to say that Winston’s going to lose on this one. 10c it’ll be plus tax. And no mention of the additional costs that will be passed on to consumers through increased freight costs among other things. 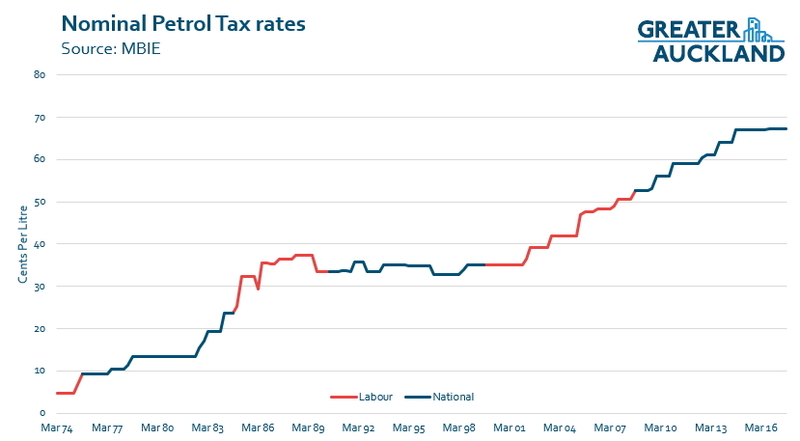 National put petrol tax up 15c across the nation during their 9 years. We must have very clear evidence of the effects of increasing petrol tax on consumers already. Labour is just doing exactly what National did, except their targeting it only to the regions in question rather than making the whole country pay. The world is going to end. What about Nationals 5 petrol tax rises and GST rise? Where did that money go? Were you worried about your stereotypical,” South Auckland factory workers” then? Vance, won’t the poor south auckland factory workers i.e. mangere and favona have rapid transport options? Or should they be forced to sit on stinky buses for hours or have to buy a car? How many buses or trains are running at 2 in the morning for factory workers or anybody else for that matter? I’ve got a good idea. We could improve the PT network so they do have that option at 2 in the morning. To help pay for it, we could raise some money from fuel taxes. People driving at rush hour will use more fuel and so they’ll be able to pay proportionally more than the people who have a swift trip at 2 in the morning. Which is probably fair, since more of the rush hour commuters do currently have PT options they’re not using. People who can buy newer cars will be able to buy more efficient or electric cars. People who can’t will shoulder more of the burden. Doesn’t strike me as being that fair, really, if those cars still take up the same space in gridlock. Yes, you’re right there. So the living wage needs to be enough to be able to afford an electric car. Yes, national after 2011 election announced a 9c rise plus GST . They dont tell voters and would have had another increase if they retained government. Totally agree. None of these National voters ever moaned about John Key putting up petrol tax several times in the past 9 years but as soon as Labour does it (user pays restricted to the region), they immediately get on their high horse and think about the “poor factory workers in South Auckland”. Well, I am from South Auckland and I never heard anyone moan about fuel prices because they were already high but they vary wildly across the city. The Mobil at Otara actually had the cheapest fuel in the city apparently. I can guarantee you nobody will notice any difference with the regional fuel tax. On the other hand, everyone is much more worried about house prices and high rent. Everyone notices rent and house prices going up. – Actually I remember a lot of people (especially national supporters, claiming Key was very left wing!) complaining at the time. They got over it through. The key is to implement it in the first 6-12 months. By the time the next election comes around people will have adapted and forgotten about it, unless it actually did affect them majorly. Let’s imagine that twenty years down the track we have a mixed-use system with plenty of cyclists and electric vehicles — a worthy goal and a great outcome — but at that point, a fuel tax would be highly inequitable as it would only tax combustion vehicles with everyone else being a free rider. What other mechanisms (apart from rates) could be used to ensure that those who use the road are participating in its costs? Sounds fair to me. If you still want to burn hydrocarbons for personal transport in twenty years time then you should be taxed through the nose for doing so. At that point it would become a disincentive tax, like on cigarettes. No reason not to put a fuel tax on now, we can always implement a new charging regime by 2037 if it is more appropriate. Congestion road pricing using GPS technology -something similar to what Uber uses. For cyclists I don’t see anything, except maybe some HOP based tolls, in a similar method to skypath. For electric vehicles, I’m predicting an extension of RUC to cover them, once they start looking like impacting the tax revenue picture, which at the moment is a way off. Why do cyclists need to pay anything in addition to what they are already paying in rates and income taxes? Given that cycling infrastructure is cheaper to build and maintain than roads and cyclists take up significantly less space, they are effectively subsidizing motorists at the moment. Because some people see empty cycling infrastructure have the same thoughts people here think when they see a four lane motorway empty outside of rush hour. +1 on that what people think. Its a shame as this investment in cycle infrastructure can have good savings in the public health costs. However due to the difficulty to actually calculate the true value its going to be tough convincing these people who already see it as a waste of money. E.g. Hoskin. Firstly the fuel tax will only be providing additional income to supplement what is already being paid for via rates and general taxation. Secondly the reason the fuel tax is needed at the moment is to build the new infrastructure. 20 years down the track when many of the big PT projects have been built we may not need it anymore. Thirdly the RUC exemption on EVs is only temporary to encourage people to buy them. Once enough cars are on the road they will start paying RUCs just like every diesel vehicle currently on the road. If there’s one thing people who can afford Teslas need, it’s a subsidy. Well there are Nissan Leafs on Trademe for under $10k, so it isn’t just Tesla buyers being subsidised. 10k Leaf probably has a battery that is nearly EOL. Still the cost of battery replacement is dropping. Very good points Nicholas! Equity is so often forgotten, but unfortunately the principle that benefits should be shared as equally as costs seems to have been abandoned in recent years. I wouldn’t want to exempt North Shore from the fuel charge but by the same token North Shore should not be strangled with another ten-year delay on implementing light rail. It does not take ten years to build a tunnel, so then it comes down to where your first light rail line goes. To me it should surface at the currently missing Onewa station, then go up Northcote, Birkenhead and Glenfield as these are all far away from the busway. In common with East Auckland, these areas all need light rail far more urgently than the airport does, and with the change of government now is not the time to delay and muck around. I am very optimistic that light rail can quickly extend all over Auckland and like you I feel that it should be for the many rather than the few. The proposal to exempt Rodney is interesting and just, and I would go further and argue that all Aucklanders outside of the urban boundary should be exempt from this fuel tax. The North Shore got a central government funded busway last decade, along with an extension soon, while the NW, SW and East got nothing last decade, these things balance themselves in the long run. I guess the priority of North Shore v Airport LR depends on which is more important – rapid transit to the Hillsborough and Mangere areas or enhanced rapid transit to the shore. I guess another question is which has the greatest capture? The North Shore needs better PT, but LR across the harbour isn’t going to have the same capture as rail to the airport and west, for the same investment. Besides, Mangere Bridge and Hillsborough have worse PT than the shore currently does. @ David B – Same, I’d hate for any part of Auckland to be exempt the new tax. Just because an area isn’t directly benefiting from something doesn’t give them a moral exclusion to contributing to it. Though the idea that you shouldn’t have to pay for assets/infra that you don’t use is a poisonous one that seems to be quite in vogue right now. They rightly wonder why their busway which is already years behind schedule doesn’t have a similar commitment ? Agreed Jon and Alan – it doesn’t have to be a case of one or the other. Do both! Absolutely AMETI should be completed as soon as possible. David B, and the proposal to exempt Rodney is just because? Don’t a number of the Rons which have dubious economic value lie in this region? The money might come from another pot, but it is money which a significant number of Aucklanders resent because of the questionable value of the projects. I am more than happy to chip in my share because some day there with be a second harbour crossing (hopefully rail only) and it will take 13 or 14 years of petrol tax to pay for it. Rather than further cripple the next generation who will be struggling to pay superannuation and the burgeoning health costs from an overweight population let’s accumulate some money now. That’s a fair point Taka-ite; such an exemption might only make sense if the revenue raised were to be specifically ring-fenced for investment solely within the urban Auckland boundaries (which I had thought was the case but probably isn’t). Fuel taxes are as blunt an instrument as you can get. A congestion pricing scheme based on cordons would enable the money to be spent on public transport on the same corridor. But the ATAP Wallies didn’t want that. Cordon pricing is terrible, it suffers from all sorts of boundary effects. A global road price, time and place variable, is the ideal, but is not yet available. While working on that Fuel tax is the next best thing, is incredibly efficient, it incentivises less driving, and is a proxy carbon tax. It’ll do for now. And it will fund the next links in the Rapid Transit Network, wherever they are needed. It’s not less fair for those not immediately adjacent to the new Line, it’s the whole network that matters, and we all benefit and must contribute to the whole. Full pricing is never going to be an option. The technology will exist but people are never going to allow the state to track their movements to that extent and send them a bill. We all ready have second best cordons in the form of parking controls and charges (and time delays). Proper cordon pricing lets us move away from allocating space using the queuing system and move to a willingness to pay. So we get road space allocated to the right number of vehicles, we get trucks and buses moving, and we get those who dont want to pay travelling at a better time or on a better mode. But as an added advantage you can ring fence the money and spend it improving the trip for those same people who are affected by it. that makes road pricing palatable as you really are paying to improve your own travel options. Fuel taxes are indifferent to time of travel and whether or not you are driving a congested corridor or for that matter whether you are driving or mowing your lawn. Fuel taxes for transport projects are already the norm. Regional ones just make more sense for high demand areas like Auckland. “people are never going to allow the state to track their movements to that extent and send them a bill.” – Uber has kind of proven this statement to be wrong. So has Google, Apple and a huge amount of smartphone app companies. The Tech companies have proven that people will give up privacy for convenience so I see no reason why this will not work. There will be a vocal minority against it, the same type of people not on Facebook because they don’t want Facebook owning their photos. However the vast majority of people wont change their habits on being ‘tracked’. The cost and inconvenience of traffic is what will change habits. Further to Patrick’s comment, I don’t want people rat-running down my street because they’re trying to avoid a cordon. It’s bad enough now during peak periods as people try to avoid the queues to the motorway. Congestion charging is an interesting tool, one that has merit enough to be investigated for sure, but one that is going to be a pain to design. Also, it’ll take a lot of tweaking to respond to people trying to game the system – That’s not going to be cheap, even if it is simply changing a few criteria in an app (consultants and all that…). A really blunt instrument and another example of not providing a level playing field. If you drive north of SH1 you pass many fuel stations and now somewhere there will be one making 10% more profit per litre then the next one that happens. The former will boom and the latter will go bust. Not a big issue if both are owned by the large fuel company but I believe they are franchise businesses. Now my local ‘Z’ has changed to Indian ownership and the staff (I suspect a large family) work very hard to provide excellent service so I don’t bother going elsewhere which often is cheaper. I imagine there will be several similar fuel stations which go bankrupt do to no fault of the owners hard work. So this Fuel tax will be unfair. Second problem – although it will have a marginal effect on reducing driving because of cost it is likely to have a roughly equivalent increase in driving as driver decide on weekend trips to fill up for their commuting week. Certain will not solve congestion except for paying for new PT. Make that solve eventually. A congestion charge on the other hand can be tailored to specifc road conditions. Today I went to the Airport from North Shore and my driver used her mobile phone to check for fastest route and traffic jams (7 minutes delay foir the last kilometre to the airport – Waterview is wonderful but as with most road improvements it has not solved but merely moved the traffic jam). An intelligent congestion charge would charge for use of Waterview and dynamically change the charge to persude drivers to leave earlier or later or go via Pah road, etc. User pays. I don’t think there are that many petrol stations on the northern border of Auckland. Petrol can often be 20c a litre cheaper 15 mins drive from my place but I don’t usually bother with an extra trip. Yes, Kaiwaka will be able to sell cheaper petrol than Te Hana but I doubt the Te Hana garage will go under. Also the last thing we need is congestion charging that encourages people to go from a motorway to a suburban road. The whole point of Waterview was to take vehicles out of residential areas. At 5 cents I’d agree but 10 cents motivates – don’t ask the wealthy, ask my son the apprentice builder. The great thing about congestion charging is it nudges drivers to where you want them to go. If you want them on motorways thats OK – I would assume motorways are good places to put charge points so my journey this morning ought to have hit my wallet because I went over the bridge at 8am for example; it could even reward me with a negative charge at Waterview if you and the controllers think that the best. The main result might be persuading me to go to the airport early and having breakfast there. Reduce use of roads at peak capacity and we reduce need for new lanes and new roads. There are petrol stations from the CBD to Whangarei they should be competing fairly. I expect if you owned the Te Hana service station you might think differently. Of course the council could provide compensation. Congestion charging is needed and best. However it takes time and infrastructure to implement. Fuel tax is a good interim measure until we can implement congestion charging. In terms of gas stations going bust, the majority are not going to be influenced on where they fill the tank. There might be a few exceptions however they are likely few and far between. I would of thought your son ‘apprentice builder’ would most likely not change his habits, as the younger generation appear to value their time more than a few dollars savings nowadays. Obviously there are exceptions to this rule through. Intelligent congestion charge in that context is called a toll road. I don’t think you can easily establish area tolling without a complex and likely super expensive (IT project style) system. The important thing about a fuel tax is that is works now. Will be live in a few months. I don;t think anything can beat that. Maybe be blunt, but it does the job. Lets move on. Disagree that a regional fuel tax is the bluntest instrument- a national fuel tax combined with using people’s rates to pay for transport would be blunter. I’m not sure where you are coming from mfwic. Fuel taxes are the most efficient form of raising tax, especially for transport projects. It is difficult to avoid and is so easy to implement overnight at the flick of a switch. Put the price up 10c and the petrol companies just send that amount to a separate govt pot. It would be child’s play to ask for where the money comes from based on the petrol station location if you wanted to bother to target spending as most people fill up close to home. Given the variation in prices across the city, a 5% increase in petrol price will be hardly noticeable to most people and will unlikely influence driving that much. In fact I expect to see hardly any difference at all in increased PT usage. No million dollar eye-sore gantries covered with cameras reading license plates, no million dollar computer systems analysing everyone’s movements, no hassles about forgetting to pay your toll, no complicated/broken online systems to pay your monthly tolls, no paying for extra contact centre staff to deal with broken online payment systems, no private company managing the system at exorbitant rates, no rat-running down side streets to avoid charges etc. A congestion pricing system is a really, really, really, really inefficient way to raise money for the sole reason that it is hideously expensive to build and operate and maintain such a system. But a congestion pricing system is an effective tool to discourage cars in a certain area and to spread congestion further across the peak period. But that only works if the motorway isn’t congested all day long. It just depends on what you want to achieve. Raise money effectively or get people to change their travel patterns/mode within a specific area. I’m not sure about it being the most efficient. Fuel taxes pings anyone, even motor mowers, hedge trimmers, boats (that may never even touch a road), farm vehicles that are only used on their land etc. So it doesn’t really target the ‘problem’ but a wide range of uses. Now I’m not saying that’s a bad thing, fuel when burnt is a pollutant, as Patrick has mentioned before, it could be seen as a defunct carbon tax. The most efficient way would be congestion charging, as this targets the main problem we are trying to solve, and has added benefits to the transport network. It achieves the maximum benefits while only penalising the people causing the problem. But Fuel tax is the most immediate solution and good interim solution that could be converted to carbon tax once congestion charging is implemented. A petrol tax will cost most ppl $5 each time they fill up. A pittance and one I’m more than happy to pay despite its unlikely that I’d get a direct return. So what – it’s about the greater good. I’ve never had kids either but I don’t begrudge money spent on early childhood. In fact I’d go further and say keep the transport levy. We pay it now and won’t notice that it stops. We need less parochialism and greater vision if we are to make up for decades of neglect. Akl’s population is over 3 times what it was when I was born and yet apart from a few motorways until the last decade or so we’ve tried to get by on the same transport infrastructure as 50 years ago. Much like the when the CRL was first launched and it was touted by the media and naysayers as the City Rail Loop, emphasizing that it is only a loop around the City and only useful to navigate the CBD. It actually took years to get the majority on board (excuse the pun) with various Council and AT adverts and reports on the benefits to all of Auckland along with massively rising rail patronage figures. It appears the same is happening, first with the ‘Rail to the Airport’ and now the ‘Fuel Tax to fund it’. It should never have been announced that its goal was to connect Queen Street to the Airport but should have been launched as Wynyard Quarter to Roskill central rail line. Then they should have sold the benefits as a missing piece of rail infrastructure for central spine residents, connecting them to the fast growing Commerical District of the Wynyrd Qtr through the CBD. Airport discussions and official announcements around the airport connection could have come at a later date. Whilst this would mean that the discussions around Heavy rail would continue, at least it might look like the Central Rail connection would a) cost less (than the announcement of the full package) and b) be beneficial to a large grp of Aucklanders (not just airport travelers). Now with the fuel tax being associated to building a LR to the Airport itself, rather than a total PR drive to say the fuel tax will HELP cover ALL transport projects new and old, current and future its left them in a position where it may take a few years to turn opinion around….of course build it even quicker and let people see the benefit and you might not have to spin the PR side so much. I for one can’t wait for the new developments that will assist ALL of Auckland, both with their travel and their housing options. Why doesn’t anyone call CRL “Len’ s train set” anymore? I have to agree wholeheartedly. Oil prices fluctuate by more than that at any given time, and as you note, a 38c difference across the city does not alter motorists behaviour. People in the majority drive alone, and they polute our air (especially those on bikes), and should be contributing much more to better transport solutions. This may also help the conversion to electric vehicles too (although they only improve air quality, not congestion in itself). Go the 2 Phils! +1 10c/l won’t encourage less driving. Plus we need to fund the projects that will enable more people to drive less. Bring on more tax, please. Almost nothing will stop people driving. Those who love cars have an irrational infatuation – something related to power and freedom (not anything I identify with personally). If drivers were rational then all cars would have a top speed of about 110kph but Ferraris and Jaguars and other expensive illegally fast vehicles are common. I think you meant almost nothing will stop *some* people driving. 🙂 Most people just follow the norms and as the norms change, so do they. Some people actively look for ways to challenge the norms, and others look for ways to make a positive difference for themselves or society or the next generation. PT investment over the last few years have seen a shift of private vehicle use to public transport for commuting purposes. So we can definitely stop some people from driving and encourage others to drive less. Some people we will never stop driving, but I believe this is a much smaller portion of the population than a lot of people believe. Economics will stop people driving. If the cost of ownership (CAPEX) and operation (OPEX) is higher for a two car family vs a one car or NO car family with the same quality of life. Then the two car families will become less car families. Urban form needs to be change and PT needs to be built. Otherwise it’s hard to make this choice. Freedom is not about driving a car. Freedom is about choice. At the moment many people do not have the choice to not drive a car. That’s not freedom. Further there are externalities of driving cars that push the costs onto society. Finally 110 kph is not always the fastest way to move traffic – only if the road is empty. As the traffic amount increases, over flow can be faster with slow speeds. Nicholas, the most efficient speed, e.g moving the maximum amount of people per hour on our motorways, is 30km/hr. If your motorways are moving at this speed we are getting the most out of it, even if its bloody frustrating. Depends on how full it is. Best way to move people is transit. One bus at 100 kph is better than 30 cars at 30 kph. Nicholas – Absolutely transit is far superior to private vehicle, however the optimum speed to get the most capacity out of a motorway is 30km/hr. So I imagine Diesel users get away without paying the tax? Hard to apply a regional road user charge isn’t it? They apply GST to diesel so no reason a regional fuel excise couldn’t be added. Time we did away with the odd RUC system for diesel vehicles anyway. Absolutely time for the RUC to go. Us townies have said you can have your water for free; we will subsidise your power and phone connections, allow your cows to pollute our air and water ways, but time to draw a line somewhere. How do you deal with the usage of diesel powered vehicles and equipment which never drive on the road? It seems unfair to tax them at the same rate as heavy trucks. They don’t generally fill up at retail petrol stations. But if so you can get a rebate, companies already do that on fuel tax. Sam W, I guess it depends how you are viewing this tax on diesel. From my perspective it is reasonable to tax this undesirable fossil fuel wherever it is used. I am entirely comfortable that the money goes elsewhere to spend on more environmentally friendly transport solutions. I don’t get any tax rebate on the petrol that I use for my lawn mower and neither does my neighbour for petrol for his boat. What makes farm implements different? I say let”s unravel this whole RUC administrative cost and use all the money for public transport initiatives. And let us not buy into any rhetoric from the farming sector about any unfairness. I am still smarting about the fiasco of the water tax. Aucklanders pay for water for essentials like drinking, preparing food etc and why shouldn’t farmers pay their share. And or course the kick in the face was that money was going to be used around their properties improving waterways, an activity that everyone will now have to fix out of general taxation. Aucklander’s don’t pay for the water per say, they pay for the cost of treating and transporting the water. Farmers also pay for the cost of transporting the water, irrigation schemes certainly aren’t free. In saying that I support Labour’s policy for a royalty on commercial water use. If we want to tax non road use of fuel it should be though a carbon tax not a road user charge that is used to fund transport infrastructure. The best solution to the issue with private boat would just be to fund boat ramps out of the NLTF, while lawnmowers are so trivial it would cost more to administer a refund than the amount they are taxed. Same way it is dealt with in Australia and I assume many other countries, you apply for a rebate or the tax is removed from bulk supplies. It’s just a historic oddity where we make things easier for and harder for all other diesel road users of which there are a lot more. RUC system is useful and in my opinion should be expanded. Why should boats which are parked up by the beach help pay for the roads? Why should farm vehicles have to pay tax if they never touch a road? How do electric vehicles pay there way? If all these taxes were paid through RUCs we could better determine funding, e.g. Family Boats could pay towards policing fisheries and water safety. In the meantime however cant see why we cant add the tax to diesel as well? Trucks need to be charged in a way that covers the much larger road damage done by a heavier vehicle. As weight goes up, fuel use increases less slowly, but damage is much higher. A fuel tax can’t capture this. In Oz, diesel and petrol prices are the same. We should do the same, with RUC also applying to cover the extra costs resulting from having to support the most heavy vehicles. Agree Heidi, I should clarify I was thinking we should just get rid of RUCs on light vehicles and put the fuel tax on diesel. Wow the price/tax on petrol in USA in the graph is really telling. This tax is just horrific. If it wasn’t bad enough already with the dollar dropping like a stone our new government is going to sock us with a tax. By the time the dollar hits it’s low petrol will cost 30-40 cents a litre more than it does now. At 40 cents thats an extra $20 to fill a 50 litre vehicle. It’s beyond belief that this government, supposedly the champion of the poor, implements policies that adversely affect those very people. Supported of course by our massively left wing bias media. We wouldn’t need this terrible tax if the leaderless and inept Auckland Council was run by someone competent. Sadly it isn’t and we are left with this crap. Lefties have one solution to everything – Moar taxes. Maybe the horror will trickle down in time. Sorry, none of those stack up in my opinion. My vote is D). Admittedly it is not the full story because the backlog of failure to invest goes back so far. Certainly agree with C) – we have been lucky the rest of the country hasn’t noticed how Auckland absorbs national taxes. how little tax spend per taxes payed comparatively you mean? Maybe time to get EV? No RUC even. Plus EV transit lanes to bet the congestion. Fuel tax is a brain dead option of yesteryear. We are talking about generational assets being funded with a tax that simply goes into the council total revenue pot which pays 200k wages to PR execs to think of ways to tell us it’s a good idea. Just like the fairytale being sold that this new tax will somehow be ringfenced into a special account to pay for the airport train – primarily it will keep the council execs gravy train going a little longer. This is a political gift to buy the Auckland voters via the council PR machine for three years time. National didn’t want to hand cash to the council mandarins until they tightened the belt and looked at the balance sheet properly. Shelve that said Phil and keep the gravy going we’ve got a tax for that. This is a cop out option to avoid a toll system which is by far the most effective future proofed tool because it comes with demand management and as an added benefit it keeps the cash generated in AT at least and captures electric vehicles. Best go get a job at council with a ratepayer funded electric vehicle and laugh at the petrol heads from south and west Auckland wondering who’s on the train to the cbd they don’t work in. The problem with a toll pricing system is it will cost into the billions to deliver across a region of 1.7m people, which means it has a lead time of six or seven years to plan, design, get approvals, procure, build and open. Its also a system that has a lot of operating costs, so a large proportion of the monel is wasted. The northern toll road loses something like 40% of the tolls to the cost of collection (a large system would be less than that tho). A regional fuel tax is a very quick, pragmatic and fiscally efficient version of a tolling system, but I do hope that over the next decade they would work to phase out fuel taxes entirely in favour of a time of use road pricing system. GMAC – You are obviously not aware of the huge uptake in public transport usage when the right facilities are provided. Unfortunately the previous government were slow learners in this regard and wasted huge sums on excessive motorways with poor cost/benefit ratios. Incidently, I do not include the Waterview tunnel in this category as it completed the Auckland ring road. Fuel tax can be implemented quickly and is easy to administer. Congestion charging will come but we need to take some considerable care with the implementation. Warren S, you are absolutely right.with your comment regarding public transport usage. Compare Auckland and Vienna with roughly similar populations. The latter city has regularly spent $400 million dollars per year on public transport. The result is well over 900 million public transport trips per year and about half the cars of Auckland. Auckland has spent precious little and the result is, not unexpectedly, only 90 million public transport trips per year. Public transport also needs to be affordable and again we can learn from Vienna. There will be a cost in implementing cheaper public transport and low hanging fruit is for AT to raise car parking charges to help pay for this. I struggle that AT seem to feel that they need to subsidise car parking. In our area I am amazed that you can get AT parking for $5 per day (if you can get it, the waiting list is a mile long). At commercial rates this single car park would produce another half million dollars per year that could be be used elsewhere. A half decent regular service to Devenport perhaps? I found an older paper recently that looked at whether NZ road users pay the full cost of the transport system. The paper noted that road users underfund the transport system by about 20%. Its likely this is still broadly the case. The paper noted that ratepayers overfund the transport system and thus provide a subsidy to transport users. The additional funding could be used to increase the % NZTA pays on projects and would thus reduce the demand on ratepayers for transport project funding. This would free up some rates money to cover the other infrastructure deficits many councils have. ratepayers, tax payers and vehicle drivers are one in the same. Rates money will never fund infrastructure delivery at scale that is sought or required. It funds debt service which is piled up to the limit because there is zero discipline in making specific allocated project funding or revenue. Think of nz councils as having two large pots – one is for the income the other is for debt. Increasing the the former allows the later to grow. Same way as your mortgage works. Auckland C is in the spotlight because they’ve exhausted the ratepayer and only Phil wants to stop the non infra spending party, in the meantime a fuel tax buys the status quo time and he may get to build something. Political win win of convenience and self interest if ever there was a case. Only a modern toll system would break this deadlock and enforce project discipline by ring fencing the income and we would get the infrastructure we want funded and delivered in a disciplined and timely manner.